Stethoscopes are used for locating noises within machines and installations, such as those made by ventilators or pistons. These stethoscopes are ideal in preventative maintenance to check noises, control of vibrations, or the oscillation of pieces within the research and development sectors for continuous inspection. Noises made by moving components are significantly amplified with the help of a stethoscope and environmental noise is reduced by way of the well insulated headset. Electronic Stethoscopes are delivered with two different measurement points, which allows for measurements in places that are difficult to access. Some stethoscopes models offer additional functions, such as the Fourier analysis (FFT) for the accurate diagnosis of oscillations in the industrial sector, another additional function is the simultaneous detection of revolutions, or the optical inspection of the equilibrium mismatch. If you can't find the stethoscopes you are looking for, please contact us and we will help you find the best solution to suit your needs by calling our technical's offices on: UK customers +44(0) 23 809 870 30 / US customers (561) 320-9162 and our technical staff will advise you regarding our measuring instruments. Our stethoscopes are digital and mainly created to be used in the industrial and professional sectors. Our stethoscopes can be calibrated / recalibrated to meet the ISO standard, so it is possible to include the stethoscopes inside your internal quality set of tools, depending on your companys internal standards. 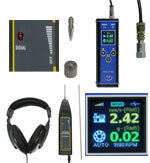 ISO calibration is formed by a laboratory calibration as well as a certification. In the certification the name and personal details of the company or the person who ordered the instrument are included. ISO calibration can be performed when the stethoscope is ordered or as an annual recalibration. Stethoscopes are usually used for the maintenance and preservation within the industrial sector however they can be also used in specific cases within the craft sector. If you wish to print a selection of the stethoscopes from our printed catalogue, click the PDF symbol.